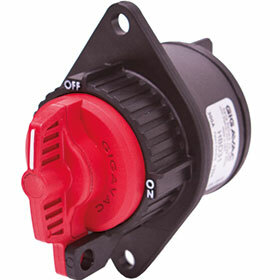 Gigavac manual disconnect switches provide a level of sealed switching technology to meet any application requirement. They incorporate important key features such as lock-out/tag-out to meet OSHA requirements, composite housings and stainless steel hardware. The BD range is built to exceed industry sealing standards IP67 and IEC529, making it an ideal choice for isolating system batteries during maintenance and other downtime situations. The HBD series of hermetically sealed switches go a step further. Using patent pending technology, it is the first truly hermetic high-power manual disconnect switch. Since the HBD can be mounted in virtually any environment it can be placed near vehicle batteries. This helps eliminate extra cable length required to place traditional switches inside the vehicle interior. Single-pole single-throw versions of the switches are rated up to 400 A and 1000 V, while double-pole double-throw models are rated up to 500 A and 32 V.